We're pleased to announce a new event specifically for Landscape Architects. In collaboration with the Society of Garden Designers, Sarah Murch of Ensata will provide an insight into the process of design with water and bringing Natural Pools, Living Pools and Wildlife Ponds into the garden. Natural Pools are becoming a popular and ecologically sound alternative to conventional swimming pools. Beautiful all year, they create a magical setting for an outdoor living space and can be contemporary, formal or naturalistic in design. Swimming in crystal clear, pure, living water has proven health benefits. A well-balanced natural pool is low maintenance, has low running costs, heats quickly with the sun and is a magnet for wildlife. Planting in and around a Natural Pool is a plant designer’s dream, with possibilities for bog gardens, new perennial meadow schemes, wildflowers, and beach screen planting, bringing pool and garden together. Similarly, a creative approach to the hard-landscaping elements of the pool may include features such as jetties, decks, paving, boulders, beaches, fountains, rills, cascades and weirs, using various hard materials suitable for a Natural Pool. With advanced filtration technology, Natural Pools and Living Pools (without the water plants) can be created for anything from smaller gardens (a plunge pool to a lake) to commercial options for hotel spas, glamping sites and public spaces, with the first public Natural Pool opening last year in London- The Kings Cross Pond. However still waters run deep and the key to the success of a Natural Pool is careful designing along with meticulous planning, keeping in mind the specific site and that maintenance must be regular and easy. 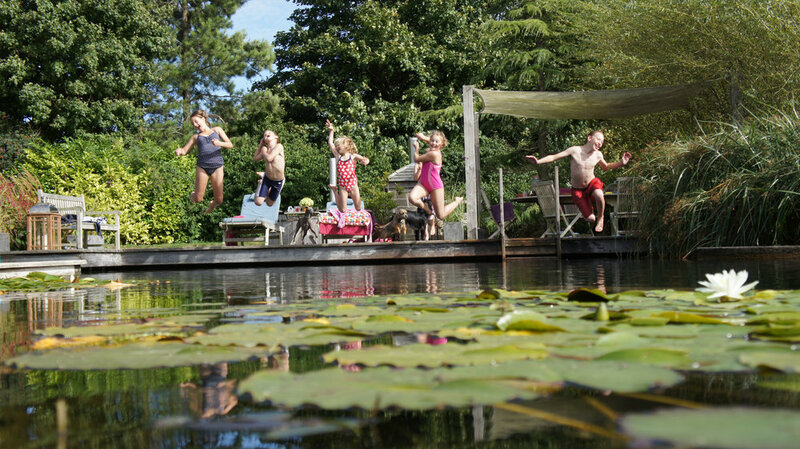 With experience designing and constructing Natural Pools for commercial and private clients and her family’s own much loved and award winning Natural Pool at Ellicar Gardens, Sarah hopes to inspire you to offer your clients this incredibly beautiful option for a swimming pool. Target audience: Anyone who is interested in designing with water and bringing Natural Pools, Living Pools and Wildlife Ponds into the garden. A new look, a new name, the same attention to detail and design. We look somewhat different, we have a fresh new identity which captures our philosophy and underscores our values. We’re really excited to announce our new name: Ensata. Ensata is a glorious species of asiatic Iris water Iris, and a favourite of ours for Natural Pools. We’ve chosen the Iris as our logo to represent our approach to the pool-spaces we create for our clients - personal expressions of an outdoor life, in-tune with nature, completely bespoke, utilising the best filtration technology available. We also have a new style across our communications. In particular you’ll see that we use new purple colouring, It’s to emphasise that Ensata is not afraid to be different, and to underline our philosophy: Our customers are individuals and we celebrate it. To complete our new identity, we have launched a new website at www.ensata.co.uk where you can find out all about our success stories, awards, and continual updates about every aspect of our approach to natural pool spaces for both consumers and commercial clients across the UK. Ensata is the award winning natural pools business based at Gringley on the Hill, Nottinghamshire. The Ensata team each bring a wealth of experience to every project, covering the design and horticulture, pool dimensioning and water quality, through to the project management and construction.